When individuals reach out to the National Runaway Safeline, frontline team members are trained to help them walk through an action plan that incorporates the options that were discussed, including local resources and informal options. NRS believes that creating a specific plan of action makes it more likely that someone will follow through. The final module of NRS’ Let’s Talk curriculum employs this same method by helping youth think about what they want in their lives and ways to get there. 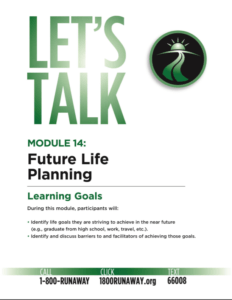 In Module 14: Future Life Planning, youth start thinking about specific life goals they have for themselves and consider what things may help them achieve these life goals and what may stand in their way. Especially for youth who may be struggling through adolescence, having a plan or goal to look forward to may get a youth to be more motivated to move forward. S/he may even think twice about running away or think more about the risks associated with certain decisions. By working through the “Road Map” activity youth can also identify obstacles that may stand in the way of them accomplishing their goals. The first thing participants do is to identify two to three life goals they have for themselves. For younger participants, it’s usually best to have them think only one year ahead, but older participants may want to think about goals they have for the next five years. These goals can be related to anything, such as school, family, a job, love, life, or travel. Examples might include graduating from high school, learning a skill, joining a club, making better grades, getting married, buying a car, or even moving out and renting/owning a home. Once youth have thought about the goals they have for their lives, they can place them on their “road map” and start to utilize “road signs” that get them to identify facilitators or barriers to that goal. If someone’s goal is to go to college, then a facilitator would be to finish high school. Youth also get a chance to think about the people or resources that are there to support them in these goals. And on the flip side, people who may be causing barriers for them to reach their goals. It’s important to remember, though, that sometimes even with a plan, not all life events can be controlled. It’s just as important for a youth to think about how s/he can react to life’s situations in a positive and healthy way. Thinking about the future can be exciting but also bring about a lot of questions. What’s next? How to get there? What if? For anyone, no matter where they are in their life, it can be good to think about what they want their future to look like and things they can do to get there. While there are events in life that can’t be controlled, knowing one’s direction and what’s important to them is a good start. Download Module 14 and NRS’ entire curriculum today!